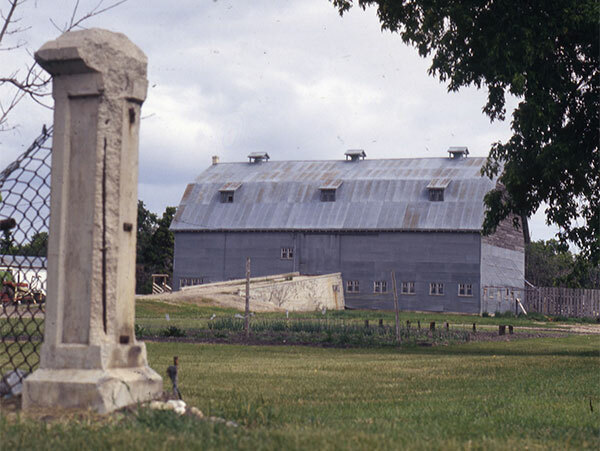 Around 1981, this barn near Balmoral in the Rural Municipality of Rockwood were featured in a Manitoba Co-operator series on rural architecture. The original caption for the photograph is given below. The concrete and earth ramp leading to upper levels of this large metal barn at Balmoral is considerably longer than the 92-foot structure it serves. It also serves to illustrate the earlier difficulty of animal or mechanical device in hauling heavy feed loads to the top storey when the barn was first built in 1932. Thomas Fox had come to the area in 1888, later buying property near town and building this well-known landmark. Featuring double glass windows, 6-inch by 6-inch timber framing, the barn also includes a basement under one-half of the lower floor area. A large wood-burning stove is still to be found in the basement, used at one time to cook a mash for cattle feeding. The huge iron pots were raised to the main level on dumb waiters located between horse and cow stalls. A milk room is located under the large front ramp. Thomas Fox and son Russell hauled more than 400 yards of gravel and used 2.5 carloads of cement to complete the barn project 50 years ago. The farm is now operated by grandson Stanley William Fox. The distinctive roofline includes three cupolas which provided ventilation to the lower and upper levels, as well as easily recognized reference for pilots referring to government air charts when approaching Winnipeg from the north. 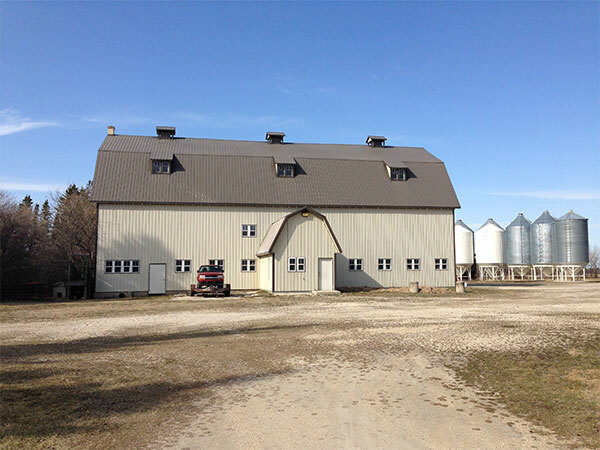 The Fox family renovated the barn in the late 1990 to accommodate a shop and removed the access ramp to the loft to make the yard more accommodating to the larger machinery needed as the farm grew. The windows were replaced and the grey tin is now beige metal with brown roof and trim. We thank Sharon Fox for providing information used here.